This paper is conceived as a case for the defence – Anthony Julius and others have said plenty for the prosecution. It was a twenty minute paper delivered to a non-specialist audience, and therefore does not deal in any depth with those poems of Eliot’s that contain racial epithets, and are open to the charge of anti-Semitism. Such an enterprise would have taken longer than the time at my disposal, but perhaps I shall return to the subject on another occasion. – and that he was Anti-Semitic. Julius extrapolates from such passages to present Eliot as a man who is defined by his anti-Semitism, and whose prejudices leak viciously into just about everything he wrote. I want to counter this, by examining what Eliot did and wrote in the year 1934. First, some historical background. In 1933, Hitler had become Chancellor of Germany, and had taken dictatorial powers. His party had pushed through anti-Semitic legislation banning Jews from certain jobs, such as newspaper editors. One Jewishgrandparent was enough to classify you as Jewish. Concentration camps were opened at Dachau, Buchenwald, Sachsenhausen and Ravensbruck. In 1934 a play appeared at the Sadlers Wells Theatre, London with a crucial scene parodying the antisemitic ideology of Fascist Blackshirts. The play is The Rock, with “book of words by T.S.Eliot”. It was a huge pageant performance, organized by the churches of London, and this paper will suggest that this scene was put in on Eliot’s initiative, as a political statement. In the scene Redshirts and Blackshirts march and counter-march, as their philosophies and practice are held up to ridicule. The verse of this scene is the liveliest in the play, and it has been placed in one of the strongest positions for a scene in the theatre, bang at the end of the first act, just before people go out to collect their thoughts (and other people’s) over a gin and tonic in the interval. The Rock was for Eliot the most public act of his career so far. Up till 1934 he had gained limited fame and sometimes notoriety for his modernist poetry, and he had become a public figure as editor and lecturer, and occasionally as a broadcaster, but his writings had not reached very far beyond a sophisticated elite. He had always been keenly interested in theatre (Many of his critical essays are about Elizabethan playwrights, and his journalistic writing has many references to the Music Hall, which he considered the most vital theatrical form of his time) but Eliot’s only attempt at play-writing to date (so far as we know) was the unfinished, and so far unperformed, Sweeney Agonistes. The Rock would be the first occasion on which he would hear the response of a theatrical audience to his work. It was an odd play, initially conceived as a pageant designed to raise money for the building of new churches in London, a cause very important to Eliot at the time. Two volumes of documents in the Bodleian Library allow us to trace the history of the project. The idea originally came from the church building fund, and Martin Browne was asked to organize the show. The first draft of a scenario, written before Eliot was recruited to the project,was a chronological pageant-progress through church history, with no real variety – just one historical scene after another, with a text composed of extracts from actual historical sermons, and crowds of parishionersacting in dumb-show. This might just have done for an outdoor pageant, but the Sadlers Wells Theatre had been booked for a fortnight for the performance, and Browne realised that something more was required. The second scenario is very different, including most of the elements of the final play. It is hard to judge how much this revision is purely Browne’s own, or to what degree it incorporates suggestions from others, such as Eliot. Now the action is carried by a group of cockney workmen, who talk about what it means to build a church, with revue-like interruptions from historical scenes, songs, and a chorus who speak Eliot’s verse. The Communist agitator was already present in Browne’s scenario, so Eliot’s importantadditionwas the introduction of two marching totalitarian groups. In this, he may have been influenced by Auden’s Dance of Death, which Eliot had published at Faber’s in 1932. In that there are Redshirts and Blackshirts, but the treatment is essentially psychological – the Redshirts are a healthy expression of rebellious energy, while the Blackshirts are a peculiarly English perversion of this. Communism, he implies, pretends to offer freedom, but instead insists on uniformity and kitsch emotion. Eliot’s characterisation of the fascists is as publicity-seekers. Though we’d rather appear in the Albert Hall. We make the deaf hear and we make the lame walk. Our methods are new in the land of the free. We make the deaf hear and we make the blind see. Fascism, he implies, definitely does not belong to the “land of the free”, or the liberal English tradition. Much is often made of Eliot’s belief in traditional order, but this was always balanced by a libertarianism, especially about freedom of expression. We’re law-keeping fellows who make our own laws. If these people support legality, it will be on their own terms. Are you obedient to the Law of GOD? Are you with those who reverence the Temple? To surrender individual judgment to a Church is a hard thing; to surrender individual judgment to a party is, for many men, a pleasant stimulant and sedative. And those who have once experienced this sweet intoxication are not easily brought back to the difficult path of thinking for themselves, and of respecting their own person and that of others. To descend to palaver with anthropoid Jews. It looks like Gold, its real name is POWER. All kneel down before it, and then begin fighting over it. at the performances of The Rock at the Sadlers Wells Theatre the house was packed – on the night I went there was standing-room only – for the whole fortnight of the production. Eliot must therefore have felt that his statement against the Blackshirt anti-Semites was a very public one – possibly the most public political statement of his life so far; it came at a time when many who were on the right in politics were attracted by the Fascist ideology. Vivienne, Eliot’s estranged wife, for example, often wore her fascist uniform when she was stalking him around London. It’s not recorded whether she wore it when she went to see The Rock. The branch of the B.U.F. To which I belong asked me to act as their chaplain. Of their own initiative they further asked that I should hold an informal service and give an address on Sunday afternoons… I was asked to use a crucifix on the flag-draped table we use as a rostrum…. The point is not whether a large number of people, with or without the inspiration of Sir Oswald Mosley and Lord Rothermere, are both zealous Fascists and devout Christians. The human mind is capable of containing the most contradictory ideas at once, especially when in a state of emotional excitement. The point is not what some people at the moment actually maintain, but whether the Christian and Catholic idea and the fascist idea are, in themselves, compatible. While in his letter Eliot claims to be not “answering this question, but putting it,” in The Rock his answer is decisive. They are not compatible. There is other evidence of Eliot’s resistance to Fascism in 1934. He wrote to A.L.Rowse, asking for support in helping a Jewish academic refugee from Nazi Germany. And as a publisher at Faber’s, he was offered a manuscript called God Among the Germans by Paul Douglass. The book was eventually published by the University of Pennsylvania Press, and distributed in Britain by Humphrey Milford at the Oxford University press, who obviously did not share Eliot’s qualms. I want to suggest that The Rock shows Eliot trying to deliberately move away from prejudice of all kinds,and that this is shown by his treatment of two other aspects of the play. The running thread of the piece comes from a group of cockney workmen, who chat about what they are doing, and its meaning. In drafts of the play, we see Eliot finding them difficult characters to write. They have to carry a lot of explication, and some very abstract ideas. 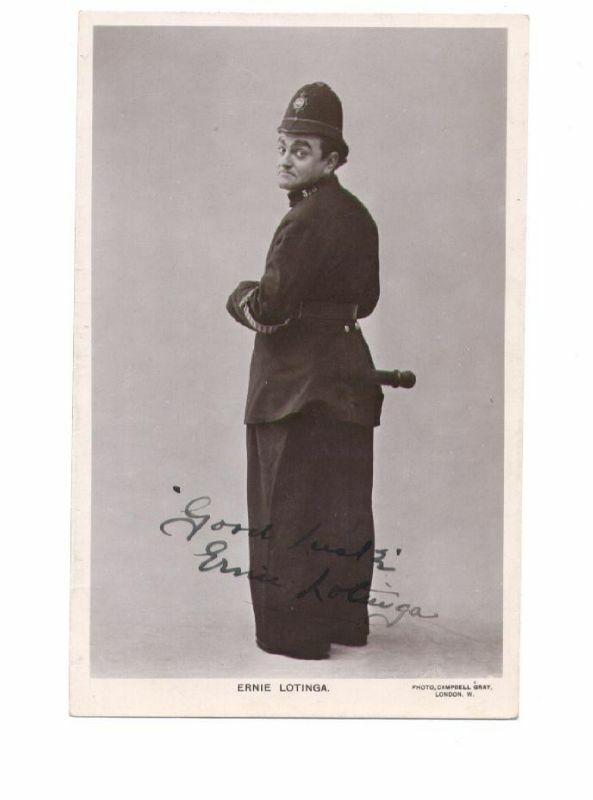 In order to liven the scenes he gives them a rather fantastic and fanciful dialect, based, I would suggest, on that used by music-hall performers, such as the fast-talking and outrageous Ernie Lotinga, whom Eliot greatly admired. Ernie Lotinga. Click the picture to see a larger version. The men recruited to play the Cockneys were from the East End Amateurs, a group organised by the Rev. Vincent Howson, (late of Sir Frank Benson’s Shakespearian Company.) Howson wrote a very long letter to Martin Browne, full of concern. I am afraid it needs a lot of rewriting. The dialect is not cockney and the speeches are not true to life… There are words introduced alien to the language, not only long words, but slang words… it is very important that the cocknies whom I am bringing along should not be given parts which prevent them getting a realistic effect naturally. Responding to these sensitivities, Eliot agreed to extensive rewriting, and there is a typescript in the Bodleian overlaid with corrections, which are almost always a toning down of the language, so that, for example, the fanciful phrase, “He’s barmy in the crumpet” becomes the more prosaic “He’s off his chump.” Eliot went out of his way to avoid negative stereotyping of the cockneys, though he must have realized that this was at the expense of the play’s linguistic vitality. The exuberance of music hall gives way to much drearier naturalism. Another section that shows Eliot’s desire to avoid obvious stereotyping is the historical section that deals with the Crusades. Brownehad originally penciled this in as just an extract from a Crusader sermon, a bit of uncomplicated righteous Christian militarism. Eliot must have realized that the morality of the Crusades was actually more dubious, and at a fairly late stage, he wrote a sequence in which two departing young crusaders aresaying goodbye, one to his sweetheart, and one to his parents. The scenes are full of phrases and references that the 1934 audience would have connected with the Great War. The young soldier is confident that it will all be over in six months, and his mother is knitting him a comforter, for example. As a scene in a historical pageant, it has something of the uncomplicated sentimentality of similar scenes in Noel Coward’s Cavalcade. Intellectual critics hated it – D. W. Harding in Scrutiny, for example, finding it “painful”. Some who were rapacious and lustful. We are expected to look at the sentimental leave-taking with disillusioned eyes. The irony that Eliot is after in this scene is not the simple pathos of Cavalcade – “They are so hopeful, but they’re going to die” – but something darker – “They’re so innocent, but war may morally corrupt them.” He is not giving his Chriustian audience the option of easy righteousness. The Rocksank from notice after its production, for a variety of reasons. With its vast cast, it was unlikely to be produced again. And it has dramatic weaknesses.Eliot applied theories about the drama that he had been formulating since the early twenties, and he clearly wanted to attain the kind of dramatic energy that his favourite music-hall comedians possessed, but the work’s ambition is its undoing. The play drew appreciative audiences of church people and others, but Eliot must have seen that it didn’t completely work. By the 1940s, Eliot was committed to a very different kind of playwriting, a merging of Greek tragedy and drawing-room comedy that more closely fitted his current preoccupations. So The Rock quietly disappeared from view, and for many years the text hasonly been available to those motivated to search in very well-stocked libraries. Eliot extracted the choruses (the most conventionally Eliotish and preachiest pieces of the play) and put them into the Collected Poems, of which, they form the longest but possibly the least-read section. This neglect (and the failure up till now of the Eliot estate to allow a proper Collected Works ) has allowed commentators largely to ignore the play and its political implications. Or, in the case of Anthony Julius, in his attack on Eliot’s racial attitudes, to refer to this major work merely in passing while devotinglong chapters to phrases that might be considered culpable. Julius presents the case for the prosecution, and many have found his narrative convincing. It is the story of Eliot as a man so viscerally prejudiced that he could not help his anti-Semitic attitudes leaking into every aspect of his work. I don’t want to make excuses for the racial stereotyping in Eliot’s early verse, but I want to suggest a different narrative. It is of a man raised in a culture where racialism was deeply institutionalised – Let me give just one small piece of evidence for this. 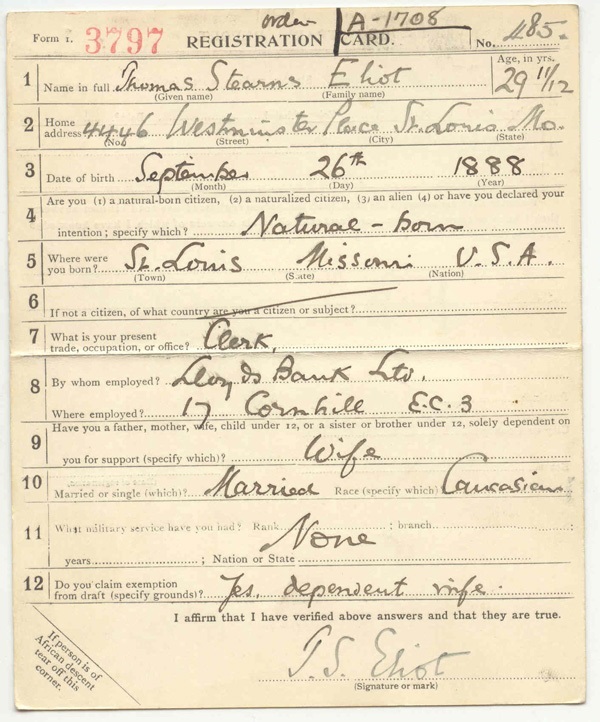 This is the draft card that Eliot filled in after America joined the war in 1917. Let me draw your attention to one detail – the bottom corner. That is where T.S.Eliot came from. But I would suggest that in 1934 he was a man attempting to distance himself from harmful prejudice of all kinds, and publicly stating his distaste for the racial philosophy that had come to power in Germany. 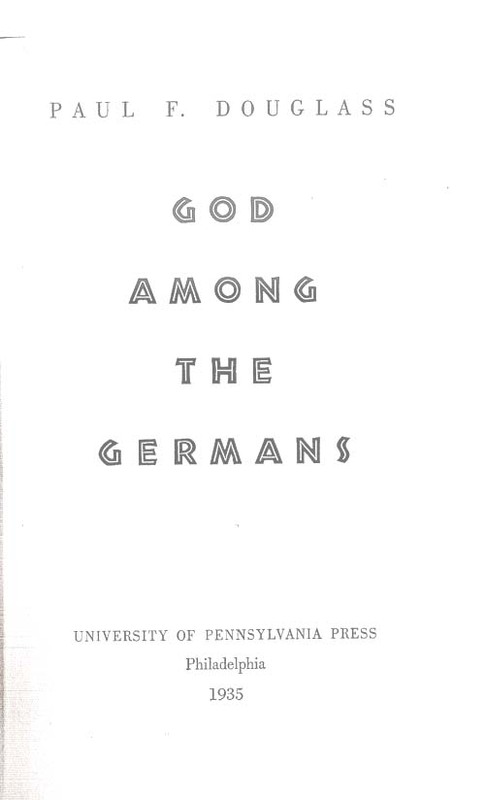 Paul F. Douglass, God Among the Germans, University of Philadelphia Press, 1935. p. 137. Ronald Schuchard, “T.S.Eliot at Fabers”, Arete issue 23, Summer/Autumn 2007. A nice site which I discovered by accident. I love poetry but have never been convinced by the poetry of Andrew Motion or of T S Eliot. I even find anthologies chosen by Mr Motion to be dull or kitsch. I have bookmarked this site and will return to keep an eye on it. Our book group is reading the “Choruses”. This is very helpful. Thanks for your good work on this. The Eliot anti-semite controversy is an anti-literary idiocy. To try to discredit his literary achievement by this means seems to me pure pettiness. Why not discredit Shakespeare on the basis of ‘The Merchant’, or Marcus Aurelius because he persecuted the Christians? Literature is never to be evaluated on the basis of the artist’s prejudices, foibles or even wickednesses, because these are always re-worked through the prejudices, foibles and wickednesses of the would-be critic. Let FR Leavis have the last say here. Have found your site really interesting and in fact in many ways close to some of my own beliefs and opinions re Eliot. I’d like to ask you whether you think that his anxiety to break with Vivienne, his first wife, could have been, at least in part, due to her Fascism? We know that she, during one period, liked to dress in the British Fascist uniform, and after TSE had left her, she joined the British Fascist party. TSE was, to be sure, deeply conservative in many ways, but (I think this is stated or implied in Peter Ackroyd´s biography) he disapproved of Fascism because he found it vulgar. A rather cute reason. At least he was more critical than Pound. I think the reasons for the break with Vivienne were much more personal than political. Her public wearing of the Fascist uniform was just one of the ways in which she embarrassed him. Ackroyd underestimates Eliot, I’d say, by implying that his dislike of the Mosleyites was either snobbish or merely aesthetic. His writings of the thirties suggest that he saw Fascism as profoundly incompatible with the Christianity to which he had become committed. I think that many of you underestimate how endemic anti-semitism was among the British upper class, and many of the “cultured class”, both before and after the Second World War. Eliot was a very intelligent man, and a close friend of Ezra Pound, who openly embraced the political creed of anti-semitic fascism; it is ridiculous to suggest that Eliot didn’t understand the context within which he was writing at the time. Litvinoff’s disgust was rightly prompted by the fact that Eliot then included his anti-semitic poems, without comment, in his Selected Poems published after everyone knew what the Nazis had done to the Jews in Europe. It’s sad that there are still people around striving to justify that. No. Eliot had strong prejudices when young, and they disfigure some of his poems. As I point out in the essay, however, he, unlike Pound, did not ’embrace the creed of anti-semitic fascism’, but distanced himself from the British fascist movement, in ‘The Rock’ and elsewhere. This was very interesting. I think you present a convincing argument to Eliot’s growth as a human being. I’m not normally one who cares who the artist was (and certainly Eliot is known for being very adamant about not reading into his personal history for answers about his poetry), but I think that since you are analysing who he is based on his work, rather than his works based on who he is, there is legitimacy to your essay. It’s four years later, but take what you can get I guess. I am doing an essay on Eliot and I researched his bio, read his poems, etc. I do not know if he was racist or not, but I suspect that he might have been. He was raised in St Louis and for me, that says a mouth full. But isn’t your large generalisation about people born in St Louis itself rather racist?